Secretion is the movement of material from one point to another, e.g. secreted chemical substance from a cell or gland. In contrast, excretion, is the removal of certain substances or waste products from a cell or organism. The classical mechanism of cell secretion is via secretory portals at the cell plasma membrane called porosomes. Porosomes are permanent cup-shaped lipoprotein structure at the cell plasma membrane, where secretory vesicles transiently dock and fuse to release intra-vesicular contents from the cell. Secretion is not unique to eukaryotes alone - it is present in bacteria and archaea as well. 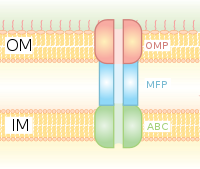 ATP binding cassette (ABC) type transporters are common to all the three domains of life. The Sec system constituting the Sec Y-E-G complex (see Type II secretion system (T2SS), below) is another conserved secretion system, homologous to the translocon in the eukaryotic endoplasmic reticulum and the Sec 61 translocon complex of yeast. Some secreted proteins are translocated across the cytoplasmic membrane by the Sec translocon, which requires the presence of an N-terminal signal peptide on the secreted protein. Others are translocated across the cytoplasmic membrane by the twin-arginine translocation pathway (Tat). Gram-negative bacteria have two membranes, thus making secretion topologically more complex. There are at least six specialized secretion systems in gram-negative bacteria. Many secreted proteins are particularly important in bacterial pathogenesis. Type I secretion system transports various molecules, from ions, drugs, to proteins of various sizes (20 – 900 kDa). The molecules secreted vary in size from the small Escherichia coli peptide colicin V, (10 kDa) to the Pseudomonas fluorescens cell adhesion protein LapA of 520 kDa. The best characterized are the RTX toxins and the lipases. Type I secretion is also involved in export of non-proteinaceous substrates like cyclic β-glucans and polysaccharides. 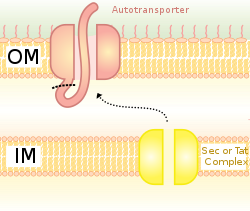 Proteins secreted through the type II system, or main terminal branch of the general secretory pathway, depend on the Sec or Tat system for initial transport into the periplasm. Once there, they pass through the outer membrane via a multimeric (12–14 subunits) complex of pore forming secretin proteins. In addition to the secretin protein, 10–15 other inner and outer membrane proteins compose the full secretion apparatus, many with as yet unknown function. Gram-negative type IV pili use a modified version of the type II system for their biogenesis, and in some cases certain proteins are shared between a pilus complex and type II system within a single bacterial species. In short, Type IV secretion system (T4SS), is the general mechanism by which bacterial cells secrete or take up macromolecules. Their precise mechanism remains unknown. T4SS is encoded on Gram-negative conjugative elements in bacteria.T4SS are cell envelope-spanning complexes or in other words 11–13 core proteins that form a channel through which DNA and proteins can travel from the cytoplasm of the donor cell to the cytoplasm of the recipient cell. Additionally, T4SS also secrete virulence factor proteins directly into host cells as well as taking up DNA from the medium during natural transformation, which shows the versatility of this macromolecular secretion apparatus. Type VI secretion systems were originally identified in 2006 by the group of John Mekalanos at the Harvard Medical School (Boston, USA) in two bacterial pathogens, Vibrio cholerae and Pseudomonas aeruginosa. These were identified when mutations in the Hcp and VrgG genes in Vibrio Cholerae led to decreased virulence and pathogenicity. Since then, Type VI secretion systems have been found in a quarter of all proteobacterial genomes, including animal, plant, human pathogens, as well as soil, environmental or marine bacteria. While most of the early studies of Type VI secretion focused on its role in the pathogenesis of higher organisms, more recent studies suggested a broader physiological role in defense against simple eukaryotic predators and its role in inter-bacteria interactions. The Type VI secretion system gene clusters contain from 15 to more than 20 genes, two of which, Hcp and VgrG, have been shown to be nearly universally secreted substrates of the system. Structural analysis of these and other proteins in this system bear a striking resemblance to the tail spike of the T4 phage, and the activity of the system is thought to functionally resemble phage infection. In addition to the use of the multiprotein complexes listed above, Gram-negative bacteria possess another method for release of material: the formation of bacterial outer membrane vesicles. Portions of the outer membrane pinch off, forming nano-scale spherical structures made of a lipopolysaccharide-rich lipid bilayer enclosing periplasmic materials, and are deployed for membrane vesicle trafficking to manipulate environment or invade at host-pathogen interface. Vesicles from a number of bacterial species have been found to contain virulence factors, some have immunomodulatory effects, and some can directly adhere to and intoxicate host cells. release of vesicles has been demonstrated as a general response to stress conditions, the process of loading cargo proteins seems to be selective. ^ Nickel W, Seedorf M (2008). "Unconventional mechanisms of protein transport to the cell surface of eukaryotic cells". Annual Review of Cell and Developmental Biology. 24: 287–308. doi:10.1146/annurev.cellbio.24.110707.175320. PMID 18590485. ^ McNeil PL, Steinhardt RA (2003). "Plasma membrane disruption: repair, prevention, adaptation". Annual Review of Cell and Developmental Biology. 19: 697–731. doi:10.1146/annurev.cellbio.19.111301.140101. PMID 14570587. ^ Chirico WJ (October 2011). "Protein release through nonlethal oncotic pores as an alternative nonclassical secretory pathway". BMC Cell Biology. 12: 46. doi:10.1186/1471-2121-12-46. PMC 3217904. PMID 22008609. ^ Boyd CD, Smith TJ, El-Kirat-Chatel S, Newell PD, Dufrêne YF, O'Toole GA (August 2014). "Structural features of the Pseudomonas fluorescens biofilm adhesin LapA required for LapG-dependent cleavage, biofilm formation, and cell surface localization". Journal of Bacteriology. 196 (15): 2775–88. doi:10.1128/JB.01629-14. PMC 4135675. PMID 24837291. ^ Cascales E, Christie PJ (November 2003). "The versatile bacterial type IV secretion systems". Nature Reviews. Microbiology. 1 (2): 137–49. doi:10.1038/nrmicro753. PMC 3873781. PMID 15035043. ^ Christie PJ, Atmakuri K, Krishnamoorthy V, Jakubowski S, Cascales E (2005). "Biogenesis, architecture, and function of bacterial type IV secretion systems". Annual Review of Microbiology. 59: 451–85. doi:10.1146/annurev.micro.58.030603.123630. PMC 3872966. PMID 16153176. ^ Christie PJ (November 2004). "Type IV secretion: the Agrobacterium VirB/D4 and related conjugation systems". Biochimica et Biophysica Acta. 1694 (1–3): 219–34. doi:10.1016/j.bbamcr.2004.02.013. PMC 4845649. PMID 15546668. ^ a b Yeo HJ, Yuan Q, Beck MR, Baron C, Waksman G (December 2003). "Structural and functional characterization of the VirB5 protein from the type IV secretion system encoded by the conjugative plasmid pKM101". Proceedings of the National Academy of Sciences of the United States of America. 100 (26): 15947–52. Bibcode:2003PNAS..10015947Y. doi:10.1073/pnas.2535211100. JSTOR 3149111. PMC 307673. PMID 14673074. ^ Lawley TD, Klimke WA, Gubbins MJ, Frost LS (July 2003). "F factor conjugation is a true type IV secretion system". FEMS Microbiology Letters. 224 (1): 1–15. doi:10.1016/S0378-1097(03)00430-0. PMID 12855161. ^ Rikihisa Y, Lin M, Niu H (September 2010). "Type IV secretion in the obligatory intracellular bacterium Anaplasma phagocytophilum". Cellular Microbiology. 12 (9): 1213–21. doi:10.1111/j.1462-5822.2010.01500.x. PMC 3598623. PMID 20670295. ^ Thanassi DG, Stathopoulos C, Karkal A, Li H (2005). "Protein secretion in the absence of ATP: the autotransporter, two-partner secretion and chaperone/usher pathways of gram-negative bacteria (review)". Molecular Membrane Biology. 22 (1–2): 63–72. doi:10.1080/09687860500063290. PMID 16092525. ^ Friesland, Brooke; et al. (2011). "Structural analysis of autotransporter components and the origin of porins". Int J Mol Biochem. 29 (13): 92–112. ^ Gerlach RG, Hensel M (October 2007). "Protein secretion systems and adhesins: the molecular armory of Gram-negative pathogens". International Journal of Medical Microbiology. 297 (6): 401–15. doi:10.1016/j.ijmm.2007.03.017. PMID 17482513. ^ Pukatzki S, Ma AT, Sturtevant D, Krastins B, Sarracino D, Nelson WC, Heidelberg JF, Mekalanos JJ (January 2006). "Identification of a conserved bacterial protein secretion system in Vibrio cholerae using the Dictyostelium host model system". Proceedings of the National Academy of Sciences of the United States of America. 103 (5): 1528–33. Bibcode:2006PNAS..103.1528P. doi:10.1073/pnas.0510322103. JSTOR 30048406. PMC 1345711. PMID 16432199. ^ Mougous JD, Cuff ME, Raunser S, Shen A, Zhou M, Gifford CA, Goodman AL, Joachimiak G, Ordoñez CL, Lory S, Walz T, Joachimiak A, Mekalanos JJ (June 2006). "A virulence locus of Pseudomonas aeruginosa encodes a protein secretion apparatus". Science. 312 (5779): 1526–30. Bibcode:2006Sci...312.1526M. doi:10.1126/science.1128393. PMC 2800167. PMID 16763151. ^ Bingle LE, Bailey CM, Pallen MJ (February 2008). "Type VI secretion: a beginner's guide". Current Opinion in Microbiology. 11 (1): 3–8. doi:10.1016/j.mib.2008.01.006. PMID 18289922. ^ Cascales E (August 2008). "The type VI secretion toolkit". EMBO Reports. 9 (8): 735–41. doi:10.1038/embor.2008.131. PMC 2515208. PMID 18617888. ^ Schwarz S, Hood RD, Mougous JD (December 2010). "What is type VI secretion doing in all those bugs?". Trends in Microbiology. 18 (12): 531–7. doi:10.1016/j.tim.2010.09.001. PMC 2991376. PMID 20961764. ^ Coulthurst SJ (2013). "The Type VI secretion system - a widespread and versatile cell targeting system". Research in Microbiology. 164 (6): 640–54. doi:10.1016/j.resmic.2013.03.017. PMID 23542428. ^ Silverman JM, Brunet YR, Cascales E, Mougous JD (2012). "Structure and regulation of the type VI secretion system". Annual Review of Microbiology. 66: 453–72. doi:10.1146/annurev-micro-121809-151619. PMC 3595004. PMID 22746332. ^ Kuehn MJ, Kesty NC (November 2005). "Bacterial outer membrane vesicles and the host-pathogen interaction". Genes & Development. 19 (22): 2645–55. doi:10.1101/gad.1299905. PMID 16291643. ^ McBroom AJ, Kuehn MJ (January 2007). "Release of outer membrane vesicles by Gram-negative bacteria is a novel envelope stress response". Molecular Microbiology. 63 (2): 545–58. doi:10.1111/j.1365-2958.2006.05522.x. PMC 1868505. PMID 17163978. Alberts B, Johnson A, Lewis J, Raff M, Roberts K, Walter P, eds. (2002). "Search: Secretion". Molecular Biology of the Cell (4th ed.). New York: Garland Science. ISBN 978-0-8153-3218-3. White D (2000). The Physiology and Biochemistry of Prokaryotes (2nd ed.). Oxford University Press. ISBN 978-0-19-512579-5. Avon D. "Home page". Cells alive!. Look up secretion in Wiktionary, the free dictionary.